Submitted by MsB on Wed, 2007-01-31 13:36. Well I've been using Franklin Covey Plan Plus for XP for years. Prior to my going electronic I used Franklin Coveys paper version and before that Day Timer. The latest version of Franklyn Covey Plan Plus for XP has so many problems when printing I just can't use it anymore:::sigh:::. We also recently converted from a PC to a Mac and until my tech guy tells me Parallels is ready for us to use going back and forth between operating systems is a pain. I use to leave the Franklyn Covey window open all day and print notes and ToDo lists for my husband etc. -8 1/2 x 11 planner pages, so that I could also use computer print outs etc. To be honest I need more space for tasks than appts. and a 8th vertical column for weekly tasks would be great. I did find a almost perfect design at Day-Timers "12421" Professional Day-Timer for Real Estate Agents. But it is only 5 1/2 x 8 1/2. I would have used this version different than suggested by using the large appt space for daily tasks and the smaller task area for appts. If I can't find something to meet my needs I may order a planner Pad Organizer. Are there any plans to make D*I*Y into a 8 1/2 by 11 size or is there a way to print it larger? :( I am not computer savvy. Submitted by nay nay on Wed, 2007-01-31 14:36. There are many different templates for letter size in the template directory - did you look there? Not sure if I misunderstood your question... Look for this one: D*I*Y Planner Calendar Pack (Letter/A4) plus many more user submitted templates. Submitted by MsB on Wed, 2007-01-31 15:43. Wow! Thank you nay nay (that's my Aunts name). Everything I read had D*I*Y smaller. Sadley it still is not what I need. It seems I always have more tasks than appointments. I wonder if that is just me. It would be great if someone came out with a weekly planner where the ToDo section was bigger than the appointment section. I just ordered the Planner Pads. Hopefully it will work for me. Submitted by nay nay on Wed, 2007-01-31 15:46. I can see if I can whip up a template for you over the weekend... I cannot guarantee anything, but at least it could be a start and then we could tweak it towards your specific needs. I just started using the Open Office Draw program, so I am still learning, but I will give it my best shot! Submitted by MsB on Wed, 2007-01-31 16:05.
nay nay that is very nice of you. I wish I could do something like that. Thanks. My vision is like the Day-Timer 1241 for Real estate Agents. But would be 8 1/2 x 11 and with more emphasis on tasks rather than appoinments. The link I had for the Day-Timer page was very long and wasn't sure if it was OK to put it here. But if you have seen the planner pages I'm speaking of what I would do is remove the times completly, put the tasks at the top where they now have appointments and write the appointments in the bottom area that they now have for tasks. Appoimtments may need more lines, but I'm not sure.The left side colum is a great place to put a weekly Master List. Submitted by ygor on Wed, 2007-01-31 16:46. Submitted by nay nay on Wed, 2007-01-31 19:13. Try this one in the User Submitted Template Directory (see name and description below). It is a Word Document, so you might be able to change some stuff if you want to... But, it has task items on top and an agenda at the bottom... Let me know what you think. Modified PlannerPad pages for GTD - 25 Jan 2007 Letter This is an MS Word template that I whipped up to make the concept of the PlannerPad more functional for me. It includes space for Next Actions by Category (@ Personal, etc. ), Next Actions by Day, and a Weekly Calendar. Submitted by kclight on Thu, 2007-02-01 18:32. 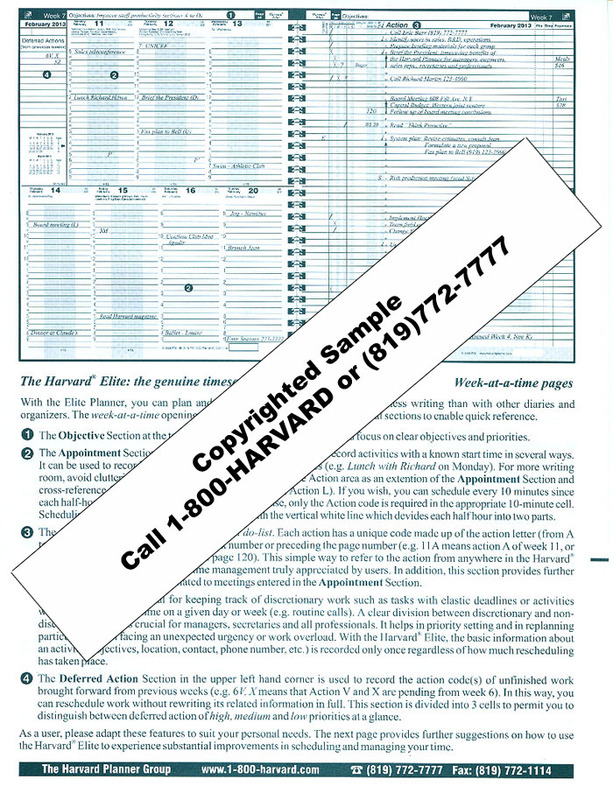 I used a Harvard Planner for years before going digital and am currently moving back to their product. IMO they were the absolute best, especially if you took the time to read their suggestions for planning/organizing your work life and used their coding. Here is a link. Let me know what you think. Submitted by javajeb on Tue, 2007-02-13 17:02.
kclight - which Harvard do you use? I've been using a Lexide covered Elite (Medium Size - about 5.5X8.5) for almost 3 years. I'm now thinking of moving that to a circa-bound. Like you mentioned, I love their methodology for planning. I'm in the process of marrying it to GTD and would like more flexibility. I dug around their site today, comparing the punched vs bound versions. The punched looked like the holes would be too big for a circa punch. So, I tore out one of my Notes pages, clipped the ruffles down to the solid edge and punched. Works great. Now I'm thinking of grabbing another copy of this year's calendar to have cut and punched for a test. The flexibility of moving pages around, inserting notes, etc would be a great improvement, and circa gives that abiblity. Submitted by Anonymous (not verified) on Sun, 2007-04-08 19:15.
you mentioned that the suggestions that come with the Harvard Planners, including their coding, is very useful. I looked around their web site and I can't find any particular reference to them. Can you tell us where we can read about this. I think that all of us here are always looking for improvements, and would welcome useful suggestions. Submitted by Anonymous (not verified) on Sun, 2007-04-08 21:32. You can get a good idea and maybe if you call the number on the banner there, they might fax or e-mail you the complete instructions so you can get an idea before you buy. I bought their planner once and it was nicely printed and put together, and I liked the concept, but I felt there would be too much of a learning curve to learn to use their instructions, and if I didn't use their techniques I would be wasting some of what I'd paid for. So that was one more planner that went on the shelf that year. Submitted by Anonymous (not verified) on Mon, 2007-04-09 04:52. Thanks for the links, Glenda. I think I'll send them a fax, as you say, to try before you buy. Submitted by nay nay on Mon, 2007-02-05 16:50. I made a template for you over the weekend. I submitted it on Sunday right before they did the upgrade, so I will have to check to see if it got lost... I will let you know when it gets added to the site and you can let me know what you think and what tweaks you would like done to it! MsB - r u there? Submitted by nay nay on Fri, 2007-02-09 15:21. Here is a link to the template - let me know any changes you want to it! Submitted by ruthmolenaar on Fri, 2012-06-08 19:28. I know it is a couple years post upload, but the link is coming up empty--did it get moved elsewhere? Submitted by ygor on Sat, 2012-06-09 17:53.
thru the templates to find one made by nay nay from around the time of that posting, and there it is ! Submitted by Anonymous (not verified) on Thu, 2007-03-22 17:11. I am a fan and user of the Franklin Covey system. How ever my wife thinks goal planning is a farce and does not support me in my goals. Has anyone else encountered this and what did you do??? Submitted by supenguin on Fri, 2007-03-23 01:03. I've read enough books on success to realize this about goals: *EVERYONE* who is successful at anything sets goals. It may not be exactly the way Franklin Covey planners do it, but they all do it. Think about this: would you drive across town without knowing where you're going? When you leave the house, do you just drive around randomly? Some days that may be fun, but if you're wanting to get to the grocery store, you set a goal (get to the grocery store) and figure out how to get there. I think the best thing to do would be get a book about goals and goal setting. The problem is, I can't recall any book I've read that is just about that. There are several books about success that cover goals & goal setting. The top two I can think of are "Seven Habits of Highly Effective People" by Stephen Covey (yes, the Franklin Covey guys) and "The Magic of Thinking Big" by David J. Schwartz. I'd recommend "The Magic of Thinking Big" - it is an easier read and it seems like your wife already doesn't like Covey. If anyone else has some book recommendation, let them be known. Submitted by LisaPT on Fri, 2007-03-23 01:47. I'm an engineer and not known for my people skills, so I shouldn't say anything. But I like to try to fix things (yes, even when they aren't broken). My advice is to not try to convince you wife on the importance of goals. Instead, tell her it is important to you and would like her support even if she doesn't agree. Let her know that you are not trying to push her into your way of doing things, just that you want acceptance for what matters to you. And make sure you are supportive of the things she likes even though you don't. Anyway, I've been married and happy for almost 11 years and learning to accept each others believes is a struggle, but ultimately worthwhile. Submitted by supenguin on Fri, 2007-03-23 03:30. Submitted by jonglass on Fri, 2007-03-23 09:56. Seriously. I'm more on your wife's side on this matter--but I'm also a "top-down" type thinker. I think that, for me, concentrating on goals is a waste of time, but my wife, o the other hand, is a very details-oriented person, and has a firm grasp on these things, but needs to concentrate on making goals, and remembering to work towards them--essential when home-schooling three children. Lots of work, but worth it all! Submitted by Kevinyc (not verified) on Sun, 2007-04-08 00:37. Most people have has goals. Does your wife not support your goals or the fact that you write them down and work towards them? Do you include your wife in your goal setting process? Does she feel threatened by your goals? Are your goals unrealistic for the time frame you set for them? More information needed. Submitted by reepicheep on Mon, 2007-04-09 14:03. I have to admit to being somewhat on your wife's side. And I suspect my own wife would react like your's if I were to ask her to support my proposal to use goal planning. Over the years I've read Covey's "7 Habits", and Barbara Sher's "Wishcraft", Bolles "What Color Is Your Parachute" (and all his other books), Buzan's "Mind Map Book" (and many of his others), and probably half-a-dozen other improvement books yet still I don't find myself convinced of formal goal planning. In the long term all these systems have proved to be "nine day wonders". Typically they require me to expend more effort on the system than the real tasks themselves necessitate. I found I could not (aka did not want to) sustain the intensity Covey/Allen/Buzan/et al demand. Therein is the reason my own wife wouldn't believe any declaration I made on switching to goal planning. I drop so many of these good intentions after a while. Most of the things I'm proud of having achieved arose because of happenstance not because I planned them. Serendipity is much more my thing. Maybe you should talk to your wife about her reluctance to support you. She will have vital things to say that you can incorporte into your system. Perhaps she doesn't want a clone of Franklin/Covey/Allen/whoever but wants to keep the man she married. Submitted by supenguin on Fri, 2007-03-23 00:53. I know multiple people who already use Parallels on a regular basis. The final version may not officially be out yet, but the preview version seems to work fine. That being said, if Franklin Covey Plan Plus isn't working on XP, it probably won't work any better on XP on Parallels. You should check out the letter size forms on this page. There are more Classic size pages than letter size on this page, but there's enough letter size you should be able to have a complete planner. Submitted by Kevinyc (not verified) on Sun, 2007-04-08 00:51. Before giving up, be very persistent with the Franklin Covey Tech people. they have a free service that operates via chat. Not all the techs are good, but most of them are,and will work with you to solve your printing problem. Most of them won't try and blame your printer or whatever. They might even try and replicate your setup if necessary. But you have to be persistent, as not all of their techs are of the same quality. Find what you are looking for yet? This might help. Submitted by johjeff on Mon, 2007-04-09 01:09. I cobbled it together from a number of different ideas. I has LOTs of room for tasks, weekly as well as daily, and a fairly compact hourly schedule. Plus it is two-page/week, so it doesn't take up too much room in your planner. It is designed for Jr. Size 5.5x8.5. I use it in a 3 ring binder. Submitted by supenguin on Mon, 2007-04-09 03:15. Is there some place you can put this file where people can get to it without an esnips account? That would be great. Submitted by johjeff on Tue, 2007-04-10 01:39. I just tried from a different computer and you are right it didn't work. I thought if I told eSnip to make it public, you could get to it without an account. Submitted by johjeff on Tue, 2007-04-10 01:55. I don't think you need an account to get to it from this link. Your feedback would be greatly appreciated. Submitted by supenguin on Tue, 2007-04-10 02:25. Thanks! That link works. I like this - the "FOCUS" I assume allows you to list your top 3 things to focus on for the week? Submitted by johjeff on Tue, 2007-04-10 04:25. Right! Initially, I intended it to be like one goal each for three areas of life, like Physical, Mental, and Spiritual, or maybe Work, Study, and Personal, or something like that. For instance, work on project X, read a chapter a day of a good book, and practice being more tolerant of others. Or, maybe, walk around the block three times during the week, study for a certification, and read 20 pages of spiritual book X.
I then decided to just leave them open ended so I or anyone else that might find them useful could do as they please with them. Next, the top box of Categories/Actions - this is where you can put all the stuff you need to do throughout the week, kind of like the GTD mind dump for the week. You can use a line for Category, then put Actions on the lines under it, or use it as an Inbox. Just make sure to process it by the end of each week so nothing gets lost. The middle is where I put tasks from the top list that need to be done on a certain day, but not a particular time. So if I have "wash car" on the top list, I will put that task on Saturday when I should have time to do it. Finally the bottom is pretty obvious - things that have a certain time assigned to them. Let me know if you come up with any additional uses for it. Thanks for checking it out.